Hola! Como esta? 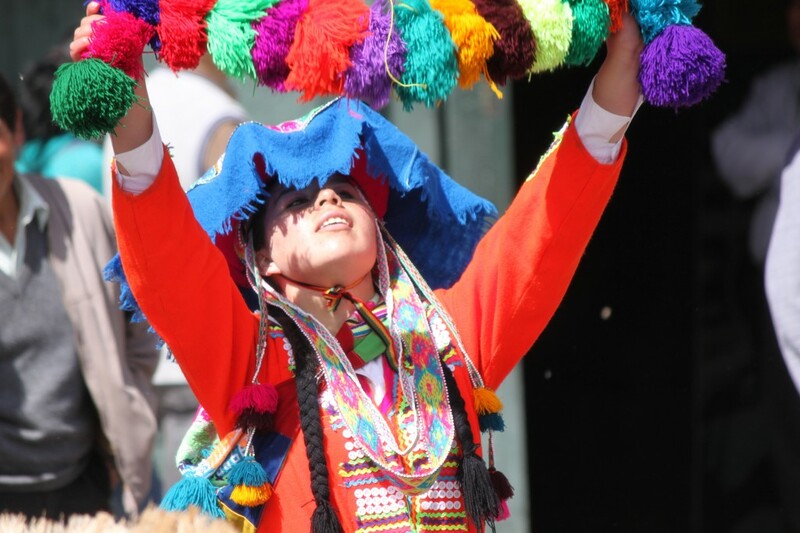 South America offers such a friendly setting with peaks between 15,000 ft to 22,844 ft. Easy access, well organize logistic, great climbing, colorful people, most interesting culture and arts. The Andes is the longest continental mountain range 7,000 km/4,300 mi. 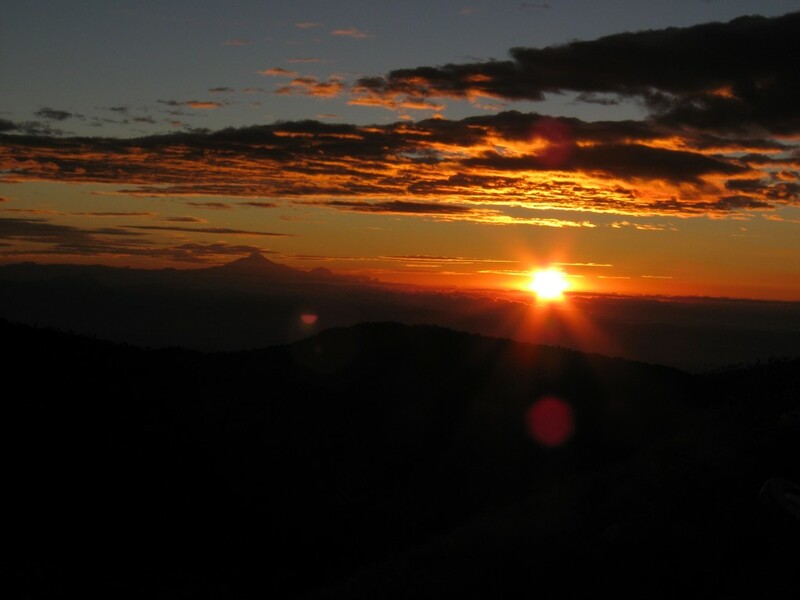 long above the Altiplano, the second highest plateau after the Tibetan plateau. The Chimborazo in the Ecuadorian Andes is the furthest point for the center of the earth. Not in south America but I will list it right here as the culture, the language makes the country close to South America, easy access, first to Mexico with a major airport and then in just few hours at the base of the mountains. Ixta 5,286m/17,342 (Iztaccihuatl) and Orizaba 5,700m/18,850 ft(Citlaltepetl) are the main peaks to climb but there is few other one. La Malinche 4,461m/14,636 ft. Nevado de Toluca 4,690m/15,354ft. This is a great introduction to high altitude climbing, not a full on expedition as we stay in mountain huts, don’t establish high camps, but experience the feel, the condition of high peaks. The alley of the volcanoes with 27 volcanoes (not counting the Galapagos volcanoes) up to 20,560 ft in height there is plenty of climbing to be done. Many peaks are very accessible. From Quito the capital at 2,800m/9,200 ft. A few hours drive brings you at the base of Cotopaxi 5,897m/19,347 ft. and Illiniza 5,248m/17,213ft. Perfect start for acclimatization and practice. Chimborazo will allow you to reach the 20,000 ft. mark. (6,267m/20,560 ft) without setting camps at high altitude as you will find mountain huts at the base. the huts are reach in a short walk. some other peaks may require setting camps but the majority are done in an alpine climb style from the hut, with a very early start, light peak for a round trip in a day. if you plan a trip to Ecuador think about visiting the Galapagos Islands as they are a wonder of our planet. The cultural center of south America, home of the Incas with peaks that looks like giant ice cream cones , the Cordillera Blanca, Vilcanota, Urubamba, Huayhuash offers expeditions to high peak up to 6,768m/22,205 ft. Huascaran, highest peak in Peru. The Alpamayo 5,947m/19,511ft. 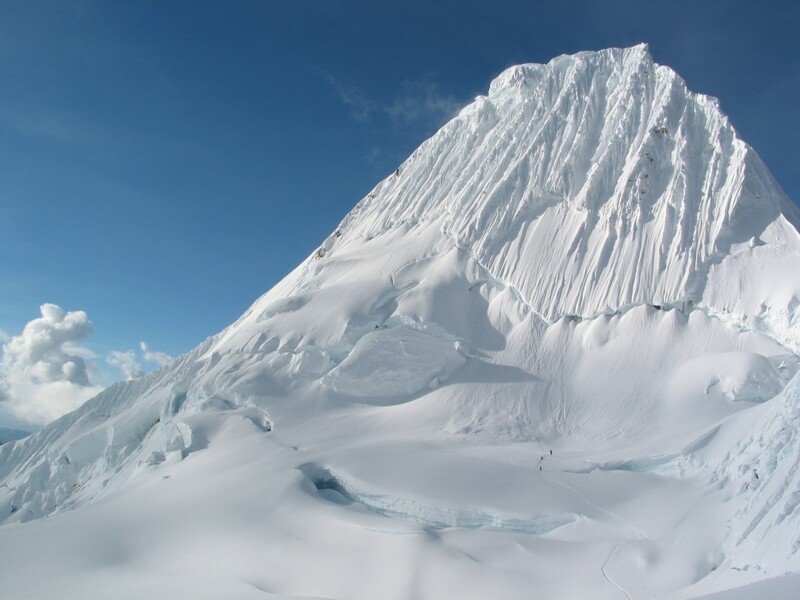 is just an incredible snow peak with flutes and snow structures that are created by the proximity of the amazon. The Andes of Peru offers a great variety of expeditions with peaks for all levels, with the help of donkeys we bring all the gear to base camp and then by establishing high camps we reach the summits. True expedition style. On the eastern side of lake Titicaca 3,811m/12,500 ft. lie the city of La Paz 3,650m/11,975 ft. the City is build on the hill side between 3000m to 4,100m (9.840 ft/13,450ft.) overlook by Illimani towering at 6,438m/21,122 ft. The Cordillera Real is a remarkable mountain range, beautiful and very accessible due to its close proximity to La Paz, the capital of Bolivia. There is great varying degree of challenge in the range. From easy to moderate climbs on the 17 and 18,000 ft. peaks of the Condoriri Group, to steep and technical climbs on 21,000 ft. of Huayna Potosi. There is something for everyone. Aconcagua, the sentinel stone roof of the Americas at 6,963m/22,844ft. A fantastic expedition no technically difficult but physically demanding and very rewarding. We meet in the city of Mendoza, home of the famous Malbec wine. we drive west for 112km/70mi. to the resort of Penitentes near the Chilean border. there is several routes to climb the mountain. the normal route follow the Horcones valley to Plaza de Mulas. The Ameghino route follow the rio de las Vacas and Relinchos valley to plaza Argentina. from both base camp the summit is reach in 2 to 4 camps depending on the tactic. From the north and the Atacama desert to the central mountain lies the second and third highest peak in south America. Ojos del Salado 6,908m/22,664ft. and Tupungato 6,800m/22,664 ft. both are great expedition, Ojos is easy as you can drive to the high camp(still very high and demanding). Tupungato is awesome, thing of Aconcagua without any body around. If you continue south there is many volcanoes to climb and better skis, further south you enter Patagonia and it’s endless, wild region. just need an adventurous mind. The blue continent. The Mount Vinson is the highest peak on the Antarctic continent located in the Ellsworth mountain range, it was first sighted by American Lincoln Ellsworth and pilot Holik Kenyon in 1935. The first ascent was performed by the American Alpine Club in 1966. Although the standard ascent route for Mt. Vinson does not present greater technical difficulties than any other glacier-based climb, it nonetheless requires extensive experience with low temperatures, strong winds and high altitude. The distance (3,500 km. south of the nearest major Chilean city, Punta Arenas) and the ascent itself make this expedition a major undertaking. Our group makes use of the best logistics in the area, provided by Adventure Network International, with over 20 years of experience on the white continent. ANI has four aircraft (1 Hercules L100, 2 Twin Otters, and 1 Cessna 185) as well as a communications and safety base at Patriot Hills. These facilities provide a solid foundation for this almost unprecedented adventure and for extraordinarily safe conditions.